The present paper demonstrates that the counterfactual value displayed by the BH qatal is a rightful and logical component of the total meaning of the suffix conjugation, understood as a network of conceptually and historically connected senses. The chaining procedure built on the framework of universal paths (viz. a theory of typologically highly plausible evolutionary scenarios) enables the author to relate six specific values of the counterfactual domain (real and unreal optative, real and unreal hypothetical, as well as real and unreal conditional), and to establish their diachronic and synchronic (i.e. conceptual) arrangement. Furthermore, by employing an analogical chaining method, the entire counterfactual block is linked to the dominant indicative type of the qatal and, in particular, to its perfect, perfective and past values. The results of the article also demonstrate that - contrary to widespread opinion -the optative use of the BH qatal does not reflect a loss or omission of an original apodosis. Quite the reverse, the optative value was the initial modal meaning that the Proto-Semitic *qatal- acquired in the vicinity of the particle *law and its negative varieties: the BH optative examples are, simply then, remnants of such an ancient usage. Furthermore, a great prevalence of the indicative uses which equal 98% of the instances where the gram appears - versus 1.5% where the modal force is available8 - has usually lead scholars to view the qatal as a prototypically indicative (or unmarked as far as modality is concerned) construction opposed to a more modally marked yiqtol.9 The inherent non-modal nature of the suffix conjugation has commonly been accepted to the point of constituting the systematic basis of the entire BH organisation. This understanding (already mentioned being extremely widespread) is even more evident in models that are explicitly built on the parameter of mood where the suffix conjugation is straightforwardly classified as realis, indicative or non-modal. For instance, Loprieno10 establishes an aspectual-modal model for Biblical Hebrew and the Semitic family in which the "perfective" qatal is defined as a positively marked realis. In a similar vein, Rattray11 classifies the qatal as a perfective realis of immediate reality. According to Zuber,12 the qatal is a "recto-Form" introducing indicative statements while Joosten13 classifies the qatal as an indicative anterior. Finally, Hatav14 understands the qatal as a non-modal form (non-modal, non-sequential, non-progressive, but positively marked for the feature 'perfect') and DeCaen15 identifies it with a past non-modal category, syntactically marked as occupying the clause's second position. Despite this almost exceptionless unanimity concerning the indicative character of the qatal, grammarians are aware of certain cases where the formation offers modal readings. One of the most typical modal uses of the suffix conjugation corresponds to examples where the gram is employed with the particles and . In such instances, the construction invariably expresses counterfactual wishes (approximating the category of an optative) or - when used in conditional protases and apodoses - counterfactual conditions (corresponding to a protetic subjunctive16 category) or hypotheses (approaching an apodotic conditional). Put differently, the qatal with and seems to be a different grammatical creature, to an extent, semantically detached from its perfect-perfective-past and indicative equivalent. Consequently, a paradoxical -at least superficially - situation may be observed: a typical indicative formation is a regular means of conveying counterfactual optative, conditional (protetic) and hypothetical (apodocic) meanings. In grammar books, the counterfactual optative-conditional-hypothetical function of the qatal has usually been marginalised and its discussion confined to a few general statements. This type of value of the suffix conjugation has principally been treated in sections devoted to conditional or volitional (optative) phrases, even being removed from chapters where the semantics of the suffix conjugation are presented.17 It appears as if grammarians do not pay attention to the optative-hypothetical qatal, with the intent to disconnect it - as unfitting to a chosen classification - from the meaning of the gram. This minimisation of the importance of the counterfactual qatal (i.e. a simple relegation to a contextual use), its non-relatedness to the predominant indicative PPP variety or, on the contrary, a strict derivativeness from an allegedly inherent main meaning of the suffix conjugation render all the descriptions offered thus far unsatisfactory and unacceptable. In order to properly understand these three weak points of the traditional models, we must explain how the meaning of a verbal form shall be represented. In particular, we must demonstrate the following: a) that all senses are to be treated with an equal relevance; b) that they are necessarily connected and hence their representation is required to explicitly specify a type of chaining which links superficially heterogeneous values; and c) that this chaining cannot be achieved by means of a derivation from the inherent meaning because such an inherent meaning fails to be a realistic linguistic phenomenon. Under this cognitive view, the meaning of a form is understood as the gram's entire semantic potential - a potential that can be activated in an immense number of concrete empirical cases. Put differently, the meaning equals a set-theoretical union of all individual atomic senses available in specific contexts. Since all such concrete senses rely on context, the total meaning of a construction is inevitably affected by its contextual settings.59 Inversely, given the fact that the overall meaning - the entire polysemy of a form - is a context-induced phenomenon (i.e. it is composed of atomic contextual senses), individual empirical instances are equally relevant and important for this total meaning of the gram. Obeying the principles of relatedness, equality of senses and non-derivability, the present paper aspires to correct the three major inaccuracies of the traditional models previously identified in section A.3. Namely, we shall propose a novel solution to the problem of the counterfactual qatal, portraying this type of the suffix conjugation as equally relevant for the entire meaning of the gram, as conceptually and diachronically connected to the dominant semantic sphere (i.e. to the indicative PPP values) but, on the other hand, without deriving it from the so-called inherent value. More specifically, in light of the cognitive and typological facts introduced above, the elucidation of the relation that necessarily exists between the counterfactual qatal and the remaining semantic potential of the gram, and hence the demonstration of the semantic coherence and homogeneity of the BH suffix conjugation, shall consist in the following. The counterfactual values of the qatal must be chained to the semantic network designed for the entire formation, in particular to its most common domain of an indicative perfect-perfective-past. This chaining must be achieved by employing a typologically plausible path (or cluster of trajectories) that would assure a conceptual and historical connection between the indicative qatal and its counterfactual uses. Furthermore, this chaining procedure should internally correlate and organise different senses of the counterfactual qatal, especially its hypothetical (conditional) and optative subtypes. Since our explanation is built on empirical contextual cases, in both their analysis and classification, it is evident that any further discussion must be preceded by a detailed description of concrete examples where the counterfactual qatal appears. Therefore, in the following part of the article, we will present all instances where this variety of the suffix conjugation is found, proposing their systematic categorisation. In 4 cases, the qatal headed by appears in counterfactual conditional protases. In such instances, it expresses counterfactual conditions or hypothesis. This counterfactuality signifies that a hypothesised activity is divergent from what actually happened or happens in the real world. When referring to an ongoing state of affairs, the counterfactuality also conveys the ideas of the unlikelihood and/or improbability of achieving an imagined situation. A given condition may, also, be unreal - it refers to the past and hence is impossible to be materialised (3 times). If the Lord had meant to kill us, he would not have accepted a burnt offering and a grain offering at our hands, or shown us all these things, or now announced to us such things as these. If Joseph would bear a grudge against us, he will certainly repay us the harm with had done him. It shall be noted that in two cases, the qatal appears in the apodosis expressing counterfactual both unreal (1.c) and real (1.b) suppositions. Would that we had died in the land of Egypt! Or would that we had died in this wilderness! Would that we had perished when our brothers perished before the Lord! Would that we had been content (If only we had been content) to dwell on the other side of the Jordan! If you only will listen to me! O that the men had only eaten today some of the plunder they took from their enemies; how greater would the slaughter of the Philistines have been! If the men had eaten today some of the plunder they took from their enemies; would not the slaughter of the Philistines have been even greater? As God lives, if you had not spoken, then only in the morning the army would have stopped pursuing their kinsmen. If you had not come quickly to meet me, not one male belonging to Nabal would have been left alive by daybreak. If the God of my father, the God of Abraham and the Fear of Isaac, had not been on my side, surely now you would have sent me away empty-handed. It shall also be noted that the apodoses in all of the quoted examples employ the qatal form with a patent sense of unreal counterfactuality: the gram introduces imaginable counterfactual unreal events and thus functions as a counterfactual unreal hypothetical. One example may be interpreted as a "false" counterfactual unreal negative optative. Under this reading, the speaker "misleadingly" wishes that a given past event would not have taken place. This wish, however, since "dishonest," offers the force of an admonition directed to the speaker himself. Put differently, the enunciator imagines (wishes) an unreal counterfactual situation in order to show how fatal and disastrous it would have been for himself. Would that I had not believed / Had I only not believed to experience the goodness of Yahweh in the land of the living! or in a more optative manner. In one case, both a conditional and optative interpretation may equally be argued. Namely, the protetic + qatal can be viewed, in harmony with more common examples (cf. 6 and 7 above), as a counterfactual unreal protetic condition, on the accomplishment of which an event expressed in the following apodosis depended. However, it is also possible to understand it in an "optative" manner, namely as a false counterfactual unreal wish. As in example (8), explained in the previous section, the speaker "dishonestly" desires that a past action would not have taken place. This wish due to its "deceitfulness" gives rise to the sense of a warning. It shall be noted that the device to use an unreal counterfactual negative optative of false wishes in order to warn or admonish is not rare in languages. Observe that in Polish the negative past optative is regularly used to wish that something had not happened (though it did in fact happen; "ah, if only it had not happened" - an honest optative sense) or in order to caution ("ah, might you only have not done it! "), insisting on disastrous implications of such a falsely desired act. In fact, in the BH example, this optative reading seems to be more correct because the clause lacks a properly fientive apodosis. In light of the provided data, we may state that the qatal headed by the particle conveys the meaning of counterfactual, both real and unreal, wishes (optative) and conditions (conditional). When it is preceded by the lexeme , the counterfactual value - again either optative or conditional - is invariably unreal. Furthermore, in various cases, when a conditional protasis contains the sequence of + qatal, the counterfactual apodosis also includes a verb in the qatal form. In such cases, the gram introduces real or unreal hypotheses (hypothetical). Having described the entire repertory of uses offered by the counterfactual optative-conditional-hypothetical qatal, we shall now introduce certain comparative facts. This evidence will be highly relevant for an appropriate mapping of this type of the BH suffix conjugation as well as for its truthful chaining to the gram's main indicative domain. The Akkadian language possesses in its verbal system the parsāku gram - a cognate form of the BH qatal. This construction is diachronically less developed than the BH suffix conjugation.69 Namely, the Akkadian parsāku is a resultative proper formation that typically denotes a static situation acquired due to a previously performed activity.70 Aside from this prototypical value, one may detect other senses that correspond to more dynamic uses where the gram approximates the category of a perfect and pluperfect. Additionally, with adjectival roots, the formation indicates current or permanent qualities and, in rare instances, the gram is employed instead of the iptaras and iprus in narrative passages with the force of a present perfect or indefinite past.71 In all of these meanings, the gram offers an indicative character. However, this Akkadian genetic equivalent of the BH qatal is also commonly found with an injunctive-optative particle lū.72 In such cases, the locution introduces positive wishes or orders, approximating an optative category, labelled as 'precative stative' (in contrast to a fientive precative liprus).73This optative value is real and factual - the accomplishment of a given desire or command is still possible and fully feasible. The entity that appears as qatal in Biblical Hebrew, as parsāku in Akkadian and as qatala in Arabic was not originally modal. More specifically, the BH qatal and its homologues in the other Semitic languages are descents of a resultative intransitive (passive when derived from transitive roots) verbal adjective used with a predicative function.109 This Proto-Semitic (PS) construction - to which we will henceforth refer to as *qatal- - provides a resultative proper sense that is still preserved in Akkadian110 (cf. section C.1 above). Being an exemplary resultative gram, the formation developed in later idioms in accordance with a typologically universal law governing the life of resultative formations, namely the anterior path. In harmony with the anterior path, in Biblical Hebrew and Arabic, the successors of the PS input construction acquired values that correspond to subsequent developmental stages. In Biblical Hebrew, the qatal attained the phase of a perfect, perfective and simple past.114 In Arabic, the gram even developed a more advance value, namely the sense of a narrative past tense (cf. section C2). The anterior path, by itself, does not account for the modal counterfactual senses provided by the BH gram - the cline does not predict any particular stage where a resultative formation could acquire such values. become freed from that milieu and appear in other environments. It can even be used in clauses that do not possess any other overt modal markers. This means that the contextually determined mood may be employed, for instance, in main clauses where, without being accompanied by modal lexemes or used in explicitly modal syntactic structures, it will still provide the modal sense it has previously incorporated.118 This entire process of transforming indicatives into moods (especially into subjunctives) has been referred to as a "modal contamination"119 - a subtype of the common process of "conventionalisation of implicature,"120 "context-induced reinterpretation,"121 or "semanticisation. "122 It shall be noted that most commonly, present indicatives develop into (or acquire senses of) real factual modality, present perfects into real factual perfect modality, past tenses into counterfactual real modality, and pluperfects into counterfactual unreal modality (cf. the modalisation of the French present, imperfective past and pluperfect in conditional protases: si tu viens and si tu est venu - real factual; si tu venais - counterfactual real and si tu avais venu -counterfactual unreal; cf. also "optative path" below). Thus, in agreement with the principle of compositionality, the interaction of a modal environment with originally non-modal grams shows that the sense of a contaminated expression is a product of the values of its components. More specifically, any type of modalisation of present, resultative present and present perfect constructions delivers a real factual modal sense. The modal contamination of a definite past generates a counterfactual real mood and the modalisation of a pluperfect triggers the value of a counterfactual unreal mood. Consequently, while the modal sense derives from contextual factors, the exact modal nuance (real factuality, real counterfactuality and unreal counterfactuality) stems from the meaning (i.e. the temporal and taxis load) of an initially non-modal verbal form. As demonstrated by numerous examples in section B, the counterfactual qatal is invariable found in clauses with or its negative variety as well as in apodoses of conditional periods whose protases are headed by such particles. The same occurs in Arabic, where the qatala normally displays a counterfactual value in the proximity of the lexeme law. The BH particle or Arabic law are descents of the PS lexeme *lau.123 As still demonstrated by Akkadian examples (cf. 11.a-c), this word (as well as its negative variant) was not a conditional conjunction. Quite the reverse, it functioned as an optative or voluntative particle.124 Conditional periods were usually headed by šumma (factual) or šumma-man (counterfactual). Furthermore, it was not limited to the counterfactual sense. It could introduce all type of wishes: real, unreal, factual and counterfactual.125 The exact value of a desire was specified by means of a verbal form employed with lū. The iprus introduced counterfactual wishes, the iparras connoted counterfactual real desires and the parsāku conveyed factual real requests or aspirations. This factual reading of the lū parsāku stemmed from a non-advancement of the Akkadian gram that continued to be mainly used as a resultative present or stative present category (cf. C.1). As explained above, presents or present perfects when modalised, regularly offer a factual real meaning. On the contrary, past tenses -simple, durative or pluperfect - commonly develop counterfactual senses. Also the history of the Arabic language demonstrates that the word law was originally a wish particle. Indeed, the optative use of the periphrasis law qatala was still relatively common in Classical Arabic.126 Nevertheless, in Modern Literary Arabic the law lexeme is most frequently used as a conditional particle introducing counterfactual protases (cf. section C.2). Consequently, we may affirm that when successors of the PS *qatal-advanced on the anterior cline and developed into past tenses (either discursive as in Biblical Hebrew or narrative as in Arabic), being also commonly employed as pluperfect, the factual and real readings were impossible while, on the contrary, counterfactual values became accessible. Thus, the original factual and real optative periphrasis *law + qatal- acquired counterfactual, real or unreal, values. The former was triggered by the optative past input (i.e. the simple past sense of the BH qatal or Arabic qatala in an optative context).127 while the latter was generated by the optative pluperfect value (i.e. the pluperfect sense of the BH qatal or Arabic qatala in an optative context). Thus, in conformity with the principle of compositionality, the sense of the counterfactual qatal is an aggregate of the values of its components: the modal optative value derives from the modal meaning of the particle *law that contaminated the non-modal resultative proper input. However, the specific type of the modality - namely real and unreal counterfactuality - stems from the sense of the BH successor of the PS *qatal-. The real counterfactual modal value is a product of the modalisation of the past tense qatal (i.e. of the qatal employed with the force of a definite past) while the unreal counterfactual value is a result of the modalisation of the pluperfect qatal (i.e. of the qatal that functions as a pluperfect). It is important to emphasise that the BH qatal in the context of - as well as the Arabic qatala in the vicinity of law - does not behave anymore as a past or pluperfect of the "normal" or non-contaminated anterior path. It does not have the same temporal connotations - most importantly, the qatal in the original past optative sense does not offer a past meaning but, exclusively, a counter-factual real sense - it refers not to a past but to a present situation! The same holds for a pluperfect variety. It is not a genuine past perfect anymore but a counterfactual unreal gram - it refers to the past and not to events that precede other past actions. This change, as already explained, is a common outcome of a modalisation of originally indicative grams (cf. section D.2 above). In our case, the modalisation is imposed by the overt optative environment. In Akkadian, since the parsaku is still a resultative present or stative present, its modalised output provides a factual real sense. However, in Biblical Hebrew and Arabic, in accordance with the rule of compositionality and due to the fact that the successors of the PS *qatal- frequently function as past tenses and as dynamic pluperfects the modal outcome is counterfactual, both real and unreal. This portion of the development - that harmonises with a regular modal contamination path, as described in section D.2 - explains the optative uses of the BH qatal. But how did the conditional and hypothetical meanings arise? In the history of Semitic languages, we deal with a complex process that consists of two distinct - although connected - changes. On the one hand, the non-modal input PS *qatal- developed in overtly marked contexts a clear modal sense of real and unreal counterfactuality. On the other, the optative lexeme *law (that imposed a modal value of the context in which the *qatal- was employed and that consequently modally contaminated the original indicative form) developed into a conditional conjunction. This means that in Biblical Hebrew and Arabic, the entire periphrasis began to be employed as a counter-factual protasis, consequently enabling the use of the qatal in counterfactual apodoses. Thus, we face two phenomena: a change from an indicative (or non-modal) into modality and from an optative (sense or gram) into a conditional and hypothetical. This latter development, as the former, is typologically common and may be illustrated by the following Latin and Germanic examples. According to a widespread opinion, most forms of the Latin present subjunctive are descents of the Proto-Indo-European (PIE) optative in *- įeh1- / - įh1-.128 It is therefore not surprising that the form rogemus, besides being most frequently used in conditional periods (Si habeat "If you should have") or subordinated syntactic milieus (impero ut facies "I order that you do"), could still be found independently, providing an optative sense of a wish (optative proper), command (jussive) or exhortation (hortative): Utinam veniat! "Would that he may come!" Rogemus "let us talk!" or Veniat "may he come! "129 Also the past subjunctive - as demonstrated in section B.3 is commonly used to indicate a counterfactual real mood in protases and apodoses - may have had its roots in original optative forms. Although there is no agreement as for the exact origin, scholars regularly posit a link to the PIE optative.130 Another highly instructive case may be found in the Germanic family. As in Latin, the present subjunctive derives from the PIE optative in *- įeh1- / - įh1-. Even more interestingly, the past subjunctive (a mood of counterfactuality) reflects etymologically the optative of the PIE perfect that, in Germanic, was used not only as a perfect but also as a simple past tense (the Germanic preterite is an amalgamation of the PIE perfect and aorist).131 This means that the optative of a past tense was transformed into a past subjunctive - a counterfactual gram. When Germanic languages developed a system of analytic perfect grams with the verb have, the past subjunctive offered values of real counterfactuality while its homologue with have (i.e. the pluperfect subjunctive) provided a counterfactual unreal sense, as still preserved in Icelandic. 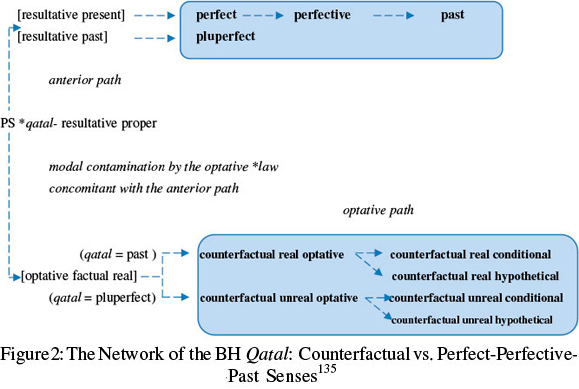 The counterfactual value of the BH qatal - composed itself of six basic senses (counterfactual real optative, counterfactual unreal optative, counter-factual real conditional, counterfactual unreal conditional, counterfactual real hypothetical and counterfactual unreal hypothetical) - may be networked as subsequent phases of two typologically plausible processes: a contamination path (a modalisation of the PS anterior-path gram *qatal-, imposed by the PS optative particle *law and its varieties) and an optative path (the spread from optative contexts to conditional periods). Our study has demonstrated that the counterfactual value displayed by the BH qatal is a rightful component of the total meaning of the suffix conjugation understood as a network of conceptually and historically connected senses. The chaining procedure built on the framework of universal paths (a theory of highly plausible evolutionary scenarios) has enabled us to correlate all the six specific senses of the counterfactual domain, establishing a diachronic and synchronic (i.e. conceptual) order among them. Furthermore, the entire counter-factual block has been linked to the dominant indicative type of the qatal and its perfect, perfective and past values. Our chaining procedure has also liberated us from interpreting the counterfactual qatal as a derivation from its -supposedly - inherent taxis, aspectual or temporal value. The posited mapping mechanism conceptually and diachronically associates a sense with another: it designs a path leading from the meaning included in the proto-input to all possible later - superficially incoherent and heterogeneous - extensions. This evolutionary link both theoretically and empirically guarantees the solidness of the established network. The results of the present research also indicate that - contrary to widespread opinion - the optative use of the BH qatal does not reflect a loss or omission of the apodosis. There is no need to posit any non-expressed apodosis in order to elucidate the optative sense provided by the gram. Quite the reverse, as explained, the optative value constituted the original modal meaning the PS *qatal- had acquired in the vicinity of the particle *law. The BH optative examples are thus remnants of such an ancient usage. Finally our study provides further typological evidence for a diachronic and conceptual split of an originally resultative gram in an indicative (a variety that develops along the anterior path) and a mood (a variety that evolves following the modal contamination path). A typologically similar scenario has been posited for the BH "short" yiqtol morphology preserved in the shape of the jussive yiqtol and the wayyiqtol.136 This article shows that this type of evolution may have occurred in the Semitic family twice. Lipiński, Edward. Semitic Languages Outline of a Comparative Grammar. Leuven: Uitgeverij Peeters en Departement Oosterse Studies, 2001. 1 This article is a result of the postdoctoral research project carried out by myself in co-operation with Professor Christo van der Merwe in the Department of Ancient Studies (University of Stellenbosch). I would like to thank Professor van der Merwe for encouragement in writing this article and for his invaluable suggestions on my linguistic ideas. 2 Leslie McFall, The Enigma of the Hebrew Verbal System (Sheffield: Almond Press, 1982), 186-187. 3 Of course, theses digits shall be understood only approximately, i.e. as illustrations of certain general tendencies. Most importantly, McFall (Enigma, 186-187) does actually not analyse the meaning of the BH verbal forms but refers to the translation equivalents of the qatal in the Revised Standard Version. The terms "qatal" and "suffix conjugation" will be employed as synonyms. It shall be noted that they do not refer to the weqatal which is treated as an entirely separate category. 4 The term gram is used as synonymous to "grammatical form," "grammatical formation," "grammatical construction" etc. 5 See, for instance, Marcel Cohen, Le Système Verbal Sémitique et l'expression du temps (Paris: Ernest Leroux, 1924), 10-16; Jerzy Kuryłowicz, Studies in Semitic Grammar and Metric (Wroclaw: Zakład Ossolińskich PAN, 1972), 80-82; and, to an extent, John Cook, "The Biblical Hebrew Verbal System" (PhD diss., University of Wisconsin-Madison, 2002), 269-272. 6 Compare Heinrich von Ewald, Ausführliches Lehrbuch der hebräischen Sprache des alten Bundes (Göttingen: Verlag der dieterichschen Buchhandlung, 1870), 349; Heinrich von Ewald, Syntax of the Hebrew Language (Edinburgh: T & T Clark, 1879), 1-3; Samuel R. Driver, A Treatise on the Use of the Tenses in Hebrew and some Other Syntactical Problems (Oxford: Clarendon, 1892), 1-5, 13-26; Andrew B. Davidson, Hebrew Syntax (Edinburgh: T & T Clark, 1902), 58-63; GKC: 309-313; Paul Joüon, Grammaire de l'hébreu biblique (Roma: Institute Biblique Pontifical, 1923), 289-292, 294-297; J. Wash Watts, A Survey of Syntax in Hebrew Old Testament (Grand Rapids: Eerdmans, 1951), 12-32; Bruce K. Waltke and Michael O'Connor, An Introduction to Biblical Hebrew Syntax (Winona Lake, Ind. : Eisen-brauns, 1990), 479-480, 486; Christo van der Merwe, Jackie Naudé and Jan Kroeze, A Biblical Hebrew Reference Grammar (Sheffield: Sheffield Academic Press, 1999), 68-70, 143-147; David Andersen, "The Evolution of the Hebrew Verbal System," ZAH 13/1 (2000): 1-66; and Cook, "The Biblical Hebrew Verbal System," 269-272. 7 See, for instance, early editions of Gesenius' grammar: Wilhelm Gesenius, Hebräische Grammatik (Halle: Renger, 1813-1842), 203-204. Compare also Joüon, Grammaire, 290-291, 296 and Jacob Weingreen, A Practical Grammar of Classical Hebrew (Oxford: Clarendon Press, 1939), 56. In more recent times, see Oswald L. Barnes, A New Approach to the Problem of the Hebrew Tenses (Oxford: Thornton, 1965), 7; Joshua Blau, "Marginalia Semitica I: The Problem of Tenses in Biblical Hebrew," IOSt 1 (1971): 24-26; Beat Zuber, Das Tempussystem des biblischen Hebräisch (Berlin: de Gruyter, 1986), 27; and Ziony Zevit, "Talking Funny in Biblical Hebrew and Solving a Problem of the Yaqtúl Past Tense" HS 29 (1988): 25-33. 8 The remaining 0.5% corresponds to so-called non-verbal uses (cf. McFall, Eningma, 186-187). 9 See already GKC: 313; Joüon, Grammaire, 304-307; Watts, Survey, 12-13, 33, 48; Waltke and O'Connor, Introduction, 493, 496-502, Van der Merwe, Naudé and Kroeze, Biblical Hebrew, 144, 148-149; and Cook, "Verbal System," 271. 10 Antonio Loprieno, Das Verbalsystem im Ägyptischen und Semitischen: Zur Grundlegung einer Aspekttheorie (Wiesbaden: Harrowitz, 1986), 110. 11 Susan Rattray, "The Tense-Mood-Aspect System of Biblical Hebrew with Special Emphasis on 1 and 2 Samuel" (PhD diss., University of Califonia, Berkley, 1992), 149-150. 13 Jan Joosten, "The long Form of the Prefix Conjugation Referring to the Past in Biblical Hebrew Prose," HS 40 (1999): 15-26 (see especially page 16). 14 Galia Hatav, The Semantics of Aspect and Modality: Evidence from English and Biblical Hebrew (Amsterdam/Philadelphia: John Benjamins, 1997), 29. 15 Vincet DeCaen, "Ewald and Driver on Biblical Hebrew 'Aspect,'" ZAH 9 (1999): 129-151 (see especially page 124). 16 In this paper, we will label the modal meaning offered in conditional protases as 'conditional' while to the value found in apodoses we will refer to as "hypothetical." 17 Cf. Driver, Treatise, 179-181; Joüon, Grammaire, 501; Ernst Jenni, Lehrbuch der hebraischen Sprache des Alten Testaments (Basel: Helbing & Lichtenhavn, 1978), 264; Van der Merwe, Naudé and Kroeze, Biblical Hebrew, 303-304. 23 Davidson, Hebrew Syntax, 179-182. 24 Davidson, Hebrew Syntax, 183. 25 Joüon, Grammaire, 501, 515. 33 Oskar Grether, Hebräische Grammatik für den akademischen Unterricht (München: Claudius Verlag, 1967), 237. 34 Grether, Hebräische Grammatik, 233. 35 Thomas O. Lambdin, Introduction to Biblical Hebrew (New York: Scribner, 1971), 278. 38 Wolfgang Schneider, Grammatik des biblischen Hebraisch: Ein Lehrbuch (Munich: Claudius Verlag, 1982), 228. 39 Waltke and O'Connor, Introduction, 493-494. 41 Waltke and O'Connor, Introduction, 493. 42 Van der Merwe, Naudé and Kroeze, Biblical Hebrew, 303-304. 43 Christo van der Merwe and Jackie Naudé, A Biblical Hebrew Reference Grammar (Rev. ed., forthcoming). 44 Cook, "Verbal System," 226-227. 45 Cook, "Verbal System," 226. 46 Cook, "Verbal System," 227. 47 On theses notions, see below in this paper. 48 Cook, "Verbal System," 226-227. 49 Cf. Driver, Treatise; Lambdin, Introduction; and Van der Merwe, Naudé and Kroeze, Biblical Hebrew. 50 Cf. Watts, Survey; and Cook, "Verbal System"; as well as, although only partly, Waltke and O' Connor, Introduction. 52 Waltke and O' Connor, Introduction. 55 Waltke and O'Connor, Introduction, 493. 56 Cook, "Verbal System," 269-27. Watts (Survey) and Waltke and O'Connor (Introduction) argue that the qatal is never a "subjunctive" or an irrealis, respectively. Cook ("Verbal System"), on the other hand, alleges that the counterfactual use of the suffix conjugation stems from its temporal past sense. 57 Barbara Lewandowska-Tomaszczyk, "Polysemy, Prototypes, and Radical Categories," in Handbook of Cognitive Linguistics (ed. Dirk Geeraerts and Hubert Cuyckens; Oxford: Oxford University Press, 2007), 139-169. See especially page 140. 58 Vyvyan Evans and Melanie Green, Cognitive Linguistics: An Introduction (Edinburgh: Edinburgh University Press, 2006), 169-170 and 331-333. 59 Evans and Green, Cognitive, 352-353, 368 and Kiki Nikiforidou, "Constructional Analysis," in Grammar, Meaning and Pragmatics (ed. Frank Brisard, Jan-Ola Östman and Jef Verschueren; Amsterdam: John Benjamins, 2009), 16-32. See especially pages 17 and 26. 60 Cf. Östen Dahl, "The Tense and Aspect Systems of European Languages in a Typological Perspective," in Tense and Aspect in the Languages of Europe (ed. Östen Dahl; Berlin: Mouton de Gruyter, 2000), 3-25. See especially page 14. See also the following references: Elizabeth Couper-Kuhlen and Margret Selting, "Introducing Interactional Linguistics," in Studies in Interactional Linguistics (ed. Margret Selting and Elizabeth Couper-Kuhlen; Amsterdam: John Benjamins, 2001), 1-22 (see especially pages 4-5); William Croft and Alan Cruse, Cognitive Linguistics (Cambridge: Cambridge University Press, 2004), 258; Nikiforidou, "Constructional," 16; and Marja-Liisa Helasvuo, "Emergent Grammar," in Grammar, Meaning and Pragmatics (ed. Frank Brisard, Jan-Ola Östman and Jef Verschueren; Amsterdam: John Benjamins, 2009), 66-73 (see especially pages 70-72). 61 Evans and Green, Cognitive, 331-333. 62 Andrea Tyler and Vyvyan Evans, The Semantics of English Prepositions: Spatial Scenes, Embodied Meaning, and Cognition (Cambridge: Cambridge University Press, 2003), 344-346. 64 Johan van der Auwera and Volker Gast, "Categories and Prototypes," in The Oxford Handbook of Typology (ed. Jae Jung Song; Oxford: Blackwell, 2011), 166189. Consult especially pages 186-188. 65 Joan Bybee, Revere Perkins and William Pagliuca, The Evolution of Grammar (Chicago: The University of Chicago Press, 1994); Östen Dahl, ed., Tense and Aspect in the Languages of Europe (Berlin/New York: Mouton de Gruyter, 2000); and Alexander Andrason, Qatal, yiqtol, weqatal y wayyiqtol: Modelo pancrónico del sistema verbal de la lengua hebrea bíblica con el análisis adicional de los sistemas verbales de las lenguas acadia y árabe (Madrid: Publicaciones de Universidad Complutense, 2011). 66 Cf. Alexander Andrason, "The Panchronic Yiqtol: Functionally Consistent and Cognitively Plausible," JHScr 10/10 (2010): 1-63; Alexander Andrason, "The Biblical Hebrew Verbal System in Light of Grammaticalization - the Second Generation," HS 52 (2011): 351-383; and Alexander Andrason, "The Biblical Hebrew Wayyiqtol - a Dynamic Definition," JHScr 11/7 (2011): 1-50. 67 Cf. Van der Auwera and Gast, "Categories," 186-188, 281 and Andrason, "Pan-chronic Yiqtol," 22; Andrason, Qatal, 69-73; and Andrason, "Wayyiqtol," 30-31. It must be observed that this path employed in order to explain a given concrete polysemy is both universal and realistic: universal since typologically plausible, but realistic because supposed to copy a real evolution of the gram under analysis. 68 Cf. Basil L. Gildersleeve and Gonzalez Lodge, Gildersleeve's Latin Grammar (London: Macmillan and Co., 1895), 385. Cf. a similar, although not duplicate, idea already in GKC: 313. These authors, however, consider only the link to conditional senses of the two Latin tenses. 69 This means that the Akkadian gram corresponds to a less advance stage of the development of an original Proto-Semitic input expression. 70 Wolfram von Soden, Grundriss der akkadishcen Grammatik (Rome: Pontificium Institutum Biblicum, 1952), 101 and John Huehnergard, A Grammar of Akkadian (Winona Lake: Eisenbrauns, 2005), 219-223. 71 Sergey Loesov, "T-Perfect in Old Babylonian: The Debate and a Thesis," in Babel and Bibel (ed. L. Kogan; Moscow: Russian State University for the Humanities, 2005), 83-181 (see especially pages 133-134) and Andrason, Qatal, 197. 72 Von Soden, Grundriss, 105, 176-177 and Huehnergard, A Grammar, 223. 73 Von Soden, Grundriss, 105. 74 Huehnergard, A Grammar, 223. 75 Huehnergard, A Grammar, 223. 76 Von Soden, Grundriss, 105. 77 Von Soden, Grundriss, 211. 78 Huehnergard, A Grammar, 119, 158 and 284. 79 Von Soden, Grundriss, 208. 80 Huehnergard, A Grammar, 98-99. 81 Von Soden, Grundriss, 206. 82 Von Soden, Grundriss, 206. 83 Von Soden, Grundriss, 211. 84 Von Soden, Grundriss, 208. 85 Von Soden, Grundriss, 106. 86 Huehnergard, A Grammar, 223. 87 Huehnergard, A Grammar, 146-147. 88 Huehnergard, A Grammar, 223. 89 Huehnergard, A Grammar, 223. 90 Von Soden, Grundriss, 107. 91 Von Soden, Grundriss, 214. 92 This means that the Arabic gram is slightly more advanced than the BH formation. It is used not only as a past tense in discourse but also in narration - a function that in Biblical Hebrew is carried out by the wayyiqtol. 93 Cf. William Wright, A Grammar of the Arabic Language (vol. 2; Cambridge: Cambridge University Press, 1964), 1-18, Janusz Danecki, Gramatyka języka arab-skiego (Warszawa: Wydawnictwo Akademickie Dialog, 1994), 153-154, Burkhart Kienast, Historische Semitische Sprachwissenschaft (Wiesbaden: Harrassowitz Ver-lag, 2001), 332 and Andrason, Qatal, 213-223. 94 Wright, A Grammar, 8-9, 347 and Yishai Peled, Conditional Structure in Classical Arabic (Wiesbaden: Harrasowitz, 1992), 38 and 53. 99 Wright, A Grammar, 6-8, 347; John Haywood and Hayim M. Nahmad, A New Arabic Grammar (London: Lund Humphries, 1965), 290-291; and Peled, Conditional, 37-40. 101 Wright, A Grammar, 7. 102 Haywood and Nahmad, Arabic Grammar, 290. 103 Wright, A Grammar, 6. 104 Haywood and Nahmad, Arabic Grammar, 291. 105 Wright, A Gramamr, 6-7. 106 Haywood and Nahmad, Arabic Grammar, 291. 107 Wright, A Grammar, 7. 108 Haywood and Nahmad, Arabic Grammar, 291. 109 Huehnergard, A Grammar, 221-223; Andersen, "The Evolution," 31, Thomas O. Lambdin and John Huehnergard, The Historical Grammar of Classical Hebrew: An Outline (Cambridge: Unpublished course hand-out, 1998); Edward Lipinski, Semitic Languages Outline of a Comparative Grammar (Leuven/Paris/Sterling: Uitgeverij Peeters en Departement Oosterse Studies, 2001), 336-337 and 341; Cook, "Verbal System," 209-219; Andrason, Qatal, 286-289; Alexander Andrason, "The BH Weqatal: A Homogenous Form with no Haphazard Functions, Part 2," JNSL 38/1 (2012): 1-30 (see page 3). 110 John Huehnergard, "Stative, Predicative Form, Pseudo-Verb," JNES 46/3 (1987): 215-232 (see especially pages 223). 111Vladimir Nedjalkov and Sergey Jaxontov, "The Typology of Resultative Constructions," in Typology of Resultative Constructions (ed. V. Nedjalkov; Amsterdam/Philadelphia: John Benjamins, 1988), 3-63; Bybee, Perkins and Pagliuca, Evolution; Dahl, Tense and Aspect; Vladimir Nedjalkov, "Resultative Constructions," in Language Typology and Language Universals: An International Handbook (vol. 2; eds. M. M. Haspelmath, E. König, W. Oesterreicher and W. Raible; Berlin: Walter de Gruyter, 2001), 928-940; Alexander Andrason, "The Akkadian Iprus from the Unidirectional Perspective," JSS 55/2 (2010): 325-345; Andrason, Qatal, 35-38; and Andrason, "Wayyiqtol," 11-13. 112 Fort an explanation of these labels, see Andrason, "Wayyiqtol," 11-13. 113 Compare Bybee, Perkins and Pagliuca, Evolution, 55-57, 98, 104-105; Mario Squartini and Pier M. Bertinetto, "The Simple and Compound Past in Romance Languages," in Tense and Aspect in the Languages of Europe (ed. Ö. Dahl; Berlin/New York: Mouton de Gruyter, 2000), 403-439 (see especially pages 406-407, 414-417 and 422). See also Dahl, "The Tense and Aspect," 15; Bernd Heine and Tania Kuteva, The Genesis of Grammar: A Reconstruction (Oxford: Oxford University Press, 2007), 151; and Andrason, "Wayyiqtol," 13-15. 114 Huehnergard, "Stative" 221-223, Andersen, "The Evolution," 31; Lipiński, Semitic Languages, 336-337 and 341; Cook, "The Biblical Hebrew Verbal System," 209-219; and Alexander Andrason, "The "Guessing" QATAL - the BH Suffix Conjugation as a Manifestation of the Evidential Trajectory," Journal for Semitics 19/2 (2010): 603-627 (see especially page 610); Andrason, Qatal, 305-307; Andrason,"The BH weqatal, Part 2," 3-5. 115 Bybee, Perkins and Pagliuca, Evolution, 240 and Andrason, "Panchronic Yiqtol," 26-28. 116 Bybee, Perkins and Pagliuca, Evolution, 26 and 235-326. 117 Östen Dahl, Tense and Aspect Systems (Oxford: Blackwell, 1985), 11; Paul Hopper and Elisabeth Traugott, Grammaticalization (Cambridge: Cambridge University Press, 2003), 82; Bybee, Perkins and Pagliuca, Evolution, 25-26. 118 Bybee, Perkins and Pagliuca, Evolution, 296. 119 Andrason, Qatal, 52-54; cf. also Alexander Andrason, "The BH Weqatal: A Homogenous Form with no Haphazard Functions, Part 1," JNSL 37/2 (2011): 1-25 (see especially pages 6-8). 120 Dahl, Tense and Aspect Systems, 11 and Bybee, Perkins and Pagliuca, Evolution, 25-26, 296. 121 Cf. Bernd Heine, Ulrike Claudi and Friederike Hünnemeyer, Grammaticalization: A Conceptual Framework (Chicago: University of Chicago Press, 1991), 71-72. 122 Cf. Hopper and Traugott, Grammaticalization, 82. However, in comparison to the above mentioned processes, the modal contamination is narrower, depicting the rise of modal formations, i.e. it is understood as one of the possible modal paths. 123 Carl Brockelmann, Grundriss der vergleichenden Grammatik der semitischen Sprachen (Hildesheim: Georg Olms, 1961), 74; Hans Bauer and Pontus Leander, Historische Grammatik der hebräischen Sprache des Alten Testamentes (Hildesheim: Georg Olms, 1962), 632; De Lacy O'Leary, Comparative Grammar of the Semitic Languages (Amsterdam: Philo Press, 1969), 275-276; and Louis Gray, Introduction to Semitic Comparative Linguistics (Amsterdam: Philo Press, 1971), 73. 124 Brockelmann, Grundriss, 642, 645. 125 Brockelmann, Grundriss, 30-31, 642. Cf., however, John Huehnergard, "Assertive *la and Hypothetical *lu/law in Semitic," JAOS 103/3 (1983): 569-593 (see especially, page 574). Huehnergard suggests that the factual use of the Akkadian lū is an innovation and corresponds to a weakening of the original counterfactual sense of this particle. Nevertheless, he admits that such a proposal is highly speculative. 127 This proposal slightly differs from a reconstruction suggested by Huehnergard ("Assertive," 574-575). As already mentioned, according to his opinion, the PS *lü was originally a counterfactual particle. Thus, the modalisation did not involve a change from factual into counterfactual. Such a proposal (accepted even by its author with a great scepticism), however, seems to be less probable that the evolution posited in this paper due to an extensive factual use of the lü and lü parsaku in Akkadian (the oldest Semitic language). Also other diachronic and typological facts strongly support our reconstruction: in accordance with the typological rule presented previously, the resultative present sense of the PS *qatal- encouraged its use in factual modal contexts while the past sense, available in Biblical Hebrew and Arabic, entailed a coun-terfactual modal value. 128 Cf. Jay Jasanoff, "The Origin of the Italic Imperfect Subjunctive," HSF 104 (1991): 84-105 (see especially pp. 86-87). 129 Cf. Edward Sonnenschein, A New Latin Grammar (Oxford: Clarendon Press, 1912), 150-167 and Augustus L. Francis and Henry Tatum, An Advanced Latin Syntax (Cambridge: Cambridge University Press, 1919), 60-63 and 104-110. 130 Jasanoff, "Origin," 90 and 93. 132 It seems, however, that the development into a conditional (and thus in protases) is more widespread. There are numerous languages that employ old optatives in protases while in apodoses they use other formations. For instance in Spanish the verb in the protasis is an old Latin pluperfect, related to an earlier optative formation. In the apo-doses however, the language uses a novel construction - a type of a future in the past ("I had to do / I was going to do") Si lo pudiese hacer, lo haría "If I could do it, I would do it." 133 The optative sense may stem from contextual factors or can be included in a verbal morpheme or auxiliary. The past and pluperfect values or grams usually stem or derive from earlier resultative presents (cf. the anterior path in section D.1). 134 Andrason, Qatal, 281 and Van der Merwe and Naudé, Reference Grammar. Andrason (Qatal, 305-307) has shown that further senses conveyed by the qatal may be mapped and explained as manifestations of two remaining paths that, jointly with the anterior track, constitute the resultative trajectory - i.e. a comprehensive evolutionary scenario governing the grammatical life of all resultative constructions. In particular, resultative-stative, stative and present temporal values have been unified and explained by employing the network of the simultaneous path (see Andrason, Qatal, 282-283, 305-307; and Andrason, "Wayyiqtol," 42), while rare cases where the qatal offers an evidential sense have been rationalised as expressions of the evidential path (cf. Andrason, "The "Guessing" QATAL," 623-624; and Andrason, Qatal, 282; on the evidential path see Alexandra Aikhenvald, Evidentiality [Oxford: Oxford University Press, 2004]; and Andrason, "The "Guessing" QATAL," 604-609). Finally, certain modal functions of the gram have been classified as a manifestation of the modal contamination path of the original resultative input (Andrason, Qatal, 300-304; on the modal contamination, see Andrason, "The BH Weqatal, Part 1," 7-8). Analogical mappings have been posited for the Arabic qatala (cf. Andrason, Qatal, 223-228). 135 The networking of stative values and the chaining of prospective senses are disregarded in this chart. For their discussion and incorporation into the semantics of the gram see Andrason, Qatal, 282-283, 305-307; and Alexander Andrason, "Future Values of the Qatal are "Logical" - How to Chain Future Senses of the Qatal to its Semantic Network?" HS (forthcoming). The semantic domains in brackets "[ ]" refer to meanings that are not conveyed anymore by the BH qatal. These values, which correspond to more original stages of the paths, have been lost during the evolution of the BH formation. They may however be found in Akkadian where the parsāku, dia-chronically a less advanced resultative gram, offers both resultative proper (present and past) and factual real optative values. The blue spheres correspond to senses conveyed by the BH gram. The arrows represent diachronic (and conceptual) progression. The stages of the anterior path have been simplified in comparison with figure 1 -only perfect, perfective (past) and past phases are represented. The perfective past phase is represented as preceding the past although as explained the change from perfective into simple past is a development that co-occur with the change from a present perfect to definite past tense. The pluperfect sense corresponds to the anterior path of the original input in a past time frame (cf. see Andrason, Qatal, 45; see also Andrason "Wayyiqtol" 12-13). 136 Cf. Alexander Andrason, "The Dynamic Short Yiqtol," JSem 21/2 (2012): 308-339.